Did you watch the Mad Men premier last night? Wasn’t Sterling hilarious? We watched it at our friends’ house and brought over apple pie and deviled eggs. Since it was a party, I wanted to make dessert easy for everyone to eat while watching the show and made these teeny apple pies. I cheated a bit and used store-bought pie dough, but they turned out really good. 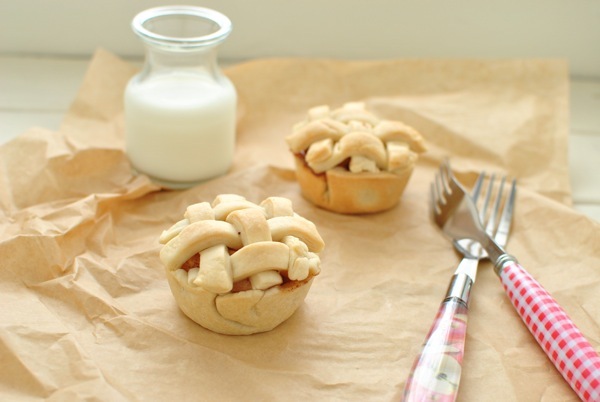 Like all the goodness of a regular apple pie squeezed into a cute little package. When I tested the recipe out on Saturday night, I minced the apple pieces but that made the pies a little too reminiscent of McDonald’s apple pies. For these little guys, I’d recommend a rough chop for the apples to keep them nice and rustic. They’re made in a muffin tin and are possibly the cutest thing I’ve baked this year. Unroll the dough. Using a cup or small bowl that’s about 3/4″ larger than the circumference of each muffin cup, cut out 12 circles of dough. Place each circle in the ungreased muffin tin and prick the bottoms of each. Reserve dough scraps in case you need more strips for the lattice tops. Peel and roughly chop apples into a medium-sized bowl. Mix in the sugar, brown sugar, cinnamon, nutmeg, salt, flour, and vanilla extract. Fill each muffin cup to the top with apple mixture. 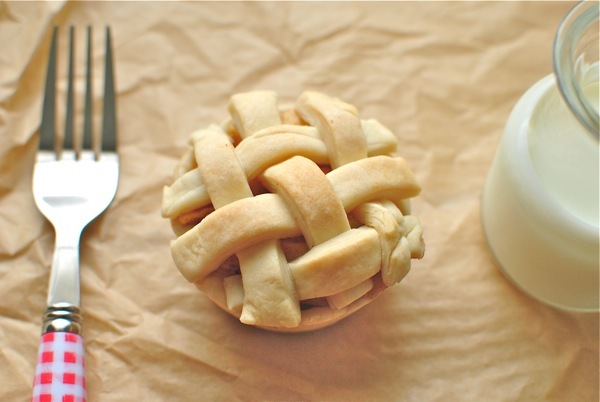 Using the remaining dough, cut out small strips to create the lattice top over the mini apple pies. Each mini pie top needs 6-8 small strips. I always reference this chart to remember how to create lattices. Place the muffin tin on a baking sheet and bake at 375 degrees for about 40 minutes, or until they start bubbling and the top turns golden brown. p.s. I didn’t get any pictures, but this is the recipe I used for the bacon deviled eggs. The bacon garnish adds a really nice texture and burst of flavor.